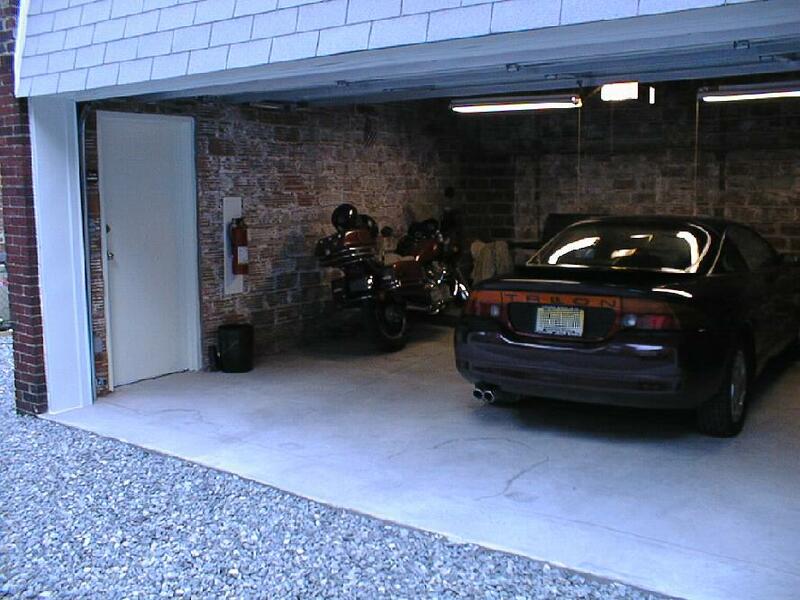 In 1998 I decided to renovate the detached garage of a house I'd purchased a few years earlier. 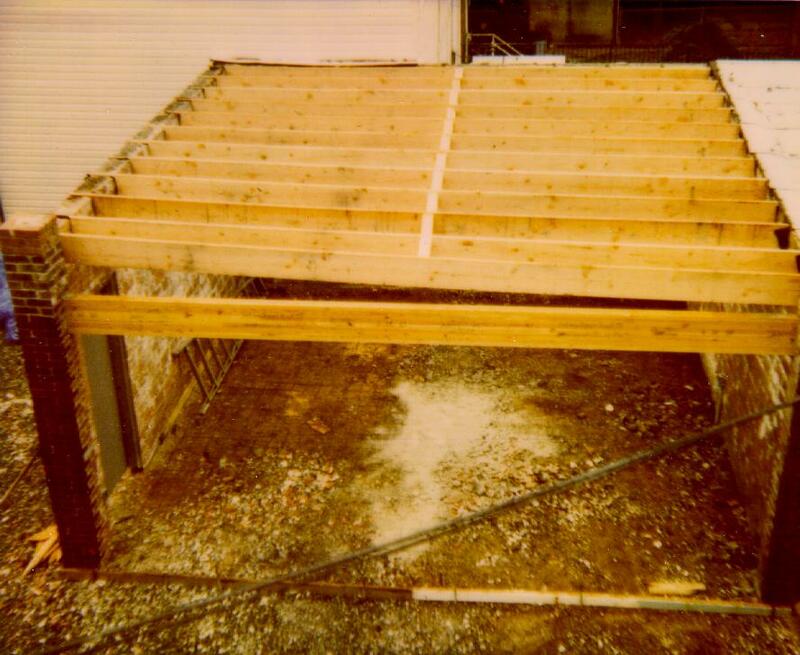 As the house was built in the 1930's, various building codes have changed greatly since then. 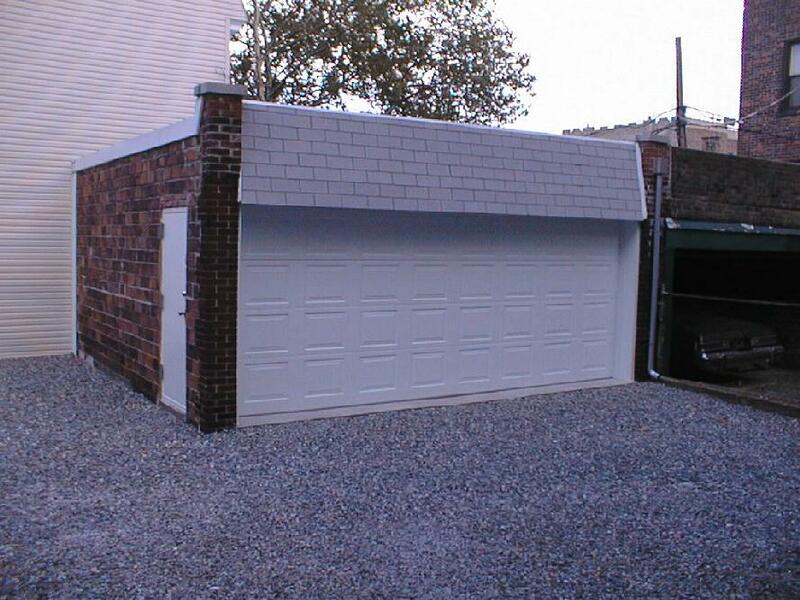 In particular, this garage has a shared wall with my neighbor's garage, as well as being right at the property line with my neighbor to the rear. Therefore, any work done would have to be repairs to the existing structure, as opposed to tearing it down and building a new one. This project was complicated by the fact that the garage is built out of chimney flue and not brick, and that by this time it was pretty much 3 walls and not much else - the floor was very thin (1" or less) concrete on top of coal ash, and the roof and doors were pretty much rotted away to nothingness. 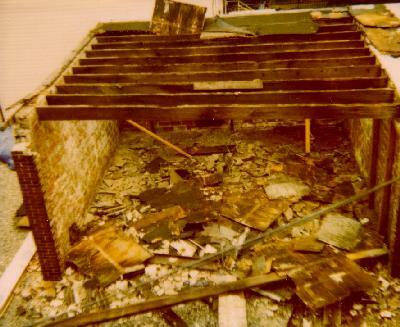 The following images document the demolition of the old roof, doors, and flooring, as well as the subsequent construction. Each image is clickable to present a full-sized version. All but the last 4 pictures were taken using a Polaroid camera and scanned/color-corrected. The last 4 were taken with an Olympus digital camera and resized to match the Polaroid scans. You might also want to look at some current pictures of the garage as well as my BMW page. Demolition commences. 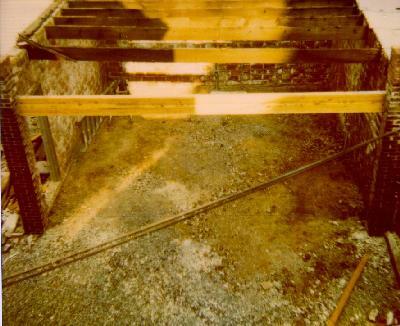 This shows the condition at the end of the first day's work, on July 17th, 1998. The diagonal lines in this and the following pictures are phone lines from a pole in the backyard to the house (this picture was taken from a second-floor window at the back of the house). Note the large brick column in the center - this originally supported an iron I-beam and the doors. Also from July 17th, a different view showing the deplorable condition of the old beams and roofing plywood. 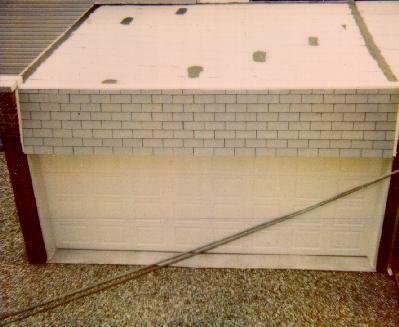 Off the image to the right is a large apartment house, where the tenants were throwing Corona beer bottles onto my garage roof. Many of these bottles would punch through the tar paper and rotted plywood with their necks and stick out of the roof. 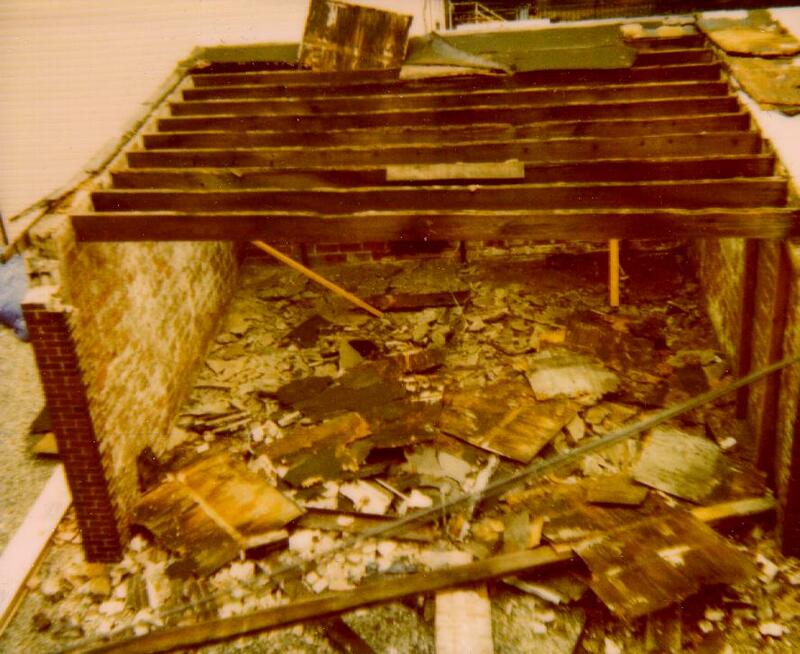 Taken on July 20th (the 18th and 19th were a weekend) this picture shows most of the rubble has been removed, an opening has been cut in the left side wall for a door, and the electrical conduits have been placed - on the center of the right and rear walls, two outlet boxes are visible. Between the door on the left and the front of the garage, another box is installed. The installation used 3/4" Schedule 40 (PVC) conduit. About 3/5 of the way across the back wall, you can see a larger conduit. This 1 1/4" conduit was left empty for "an unspecified future project" (at the time, I was planning on using it so I could install a generator in the garage for Y2K). Across the top front of the garage a microlam beam has been installed, which will support the torsion springs of the garage door. Also, repairs to the brickwork have been made at the top of the left and right side walls. New roof beams, covering the 22 foot span, have been placed, along with X-braces along the middle. 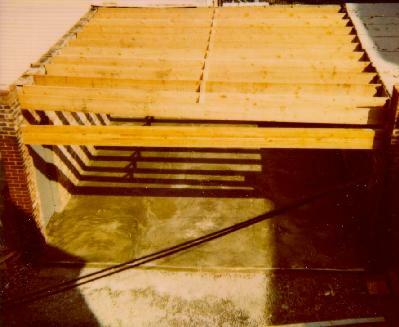 These beams are in pockets made of roofing felt in order to avoid direct contact between the brickwork and the wood - while you can get 22 foot pressure-treated 2x12's, you have to buy a whole rack of them - they aren't a stock item. 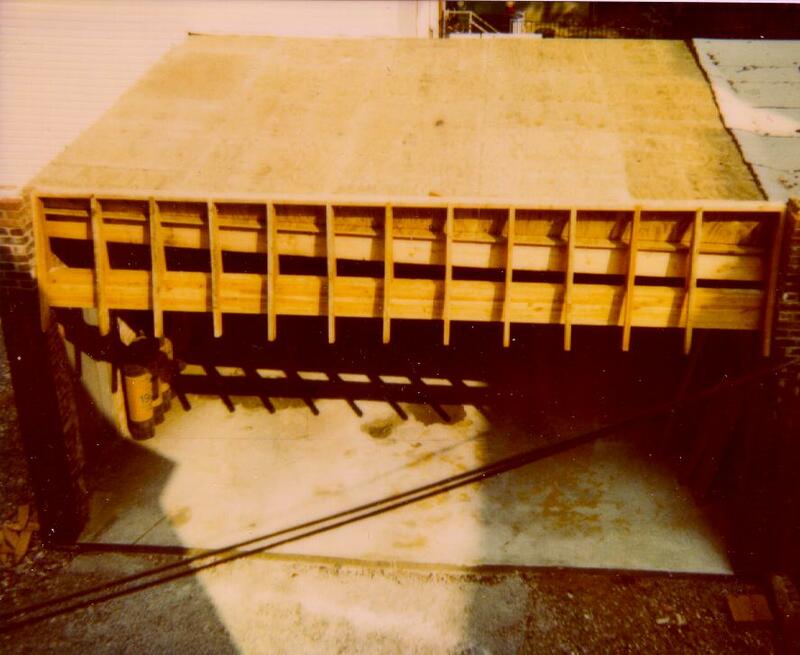 The side door has been mounted in the frame, and reinforcing mesh has been placed on the gravel base in the garage after the base has been compacted. Oiled boards have been placed across the front of the garage to contain the concrete. July 21st. July 22nd - the concrete slab has been placed. Extra labor was on-site as the concrete was delevered at the street, some 75 feet away. This is a thick slab, ranging from 6" at the front to 9 or 10 inches at the back. The concrete has been worked to a smooth finish and is starting to cure in the late-afternoon sun. On July 23rd, the plywood for the roof has been installed, as well as the face trim for the front of the garage. The plywood is pressure-treated 3/4". 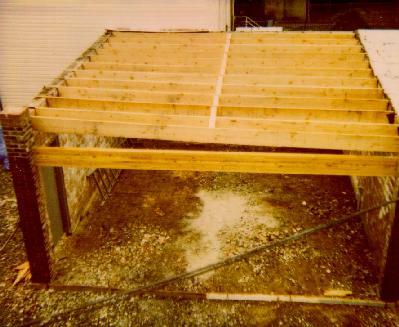 Note the slope of the roof compared with the level microlam beam. This is so water will drain off to the right-hand column, where a downspout is located. 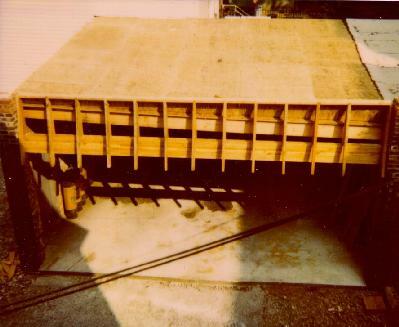 Roll roofing for tomorrow's work has been delivered and is sitting near the side door, inside the garage. July 24th - we have a roof! The roll roofing has been installed, as well as shingles on the front face. 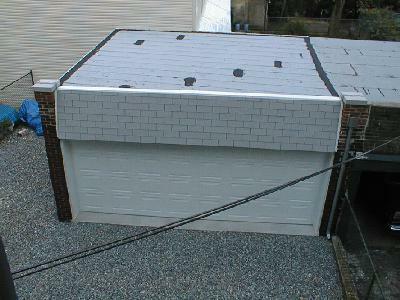 Additionally, aluminum flashing has been installed where the roofing meets the brickwork. Assorted leftover materials and refuse are being placed into buckets so they can be carted away in the future. After taking a well-earned vacation, work resumes on August 12th with gravel being added to the driveway to bring the level up to the garage slab. Also, the side door has been painted and the electrical wiring was installed in the conduits which were placed earlier in the project. 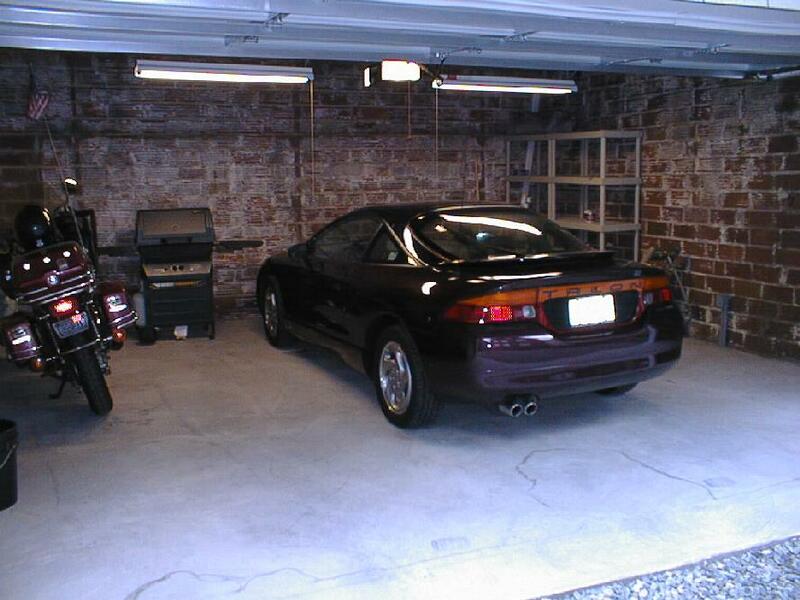 The car has moved back into the garage. Only a few finishing touches remain to be done, and they have to wait until after the door contractor installs the garage door. Once the basic garage renovation was done, the door contractor could come back for final measurements and order/install the door. In this shot from September 9th, the door and opener have been installed and aluminum trim with vinyl flashing has been installed around the door. 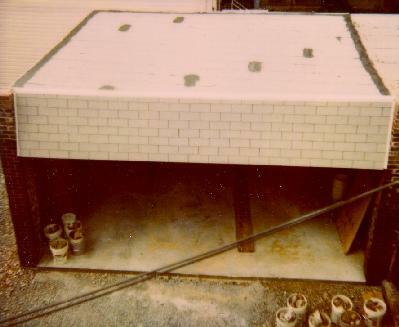 The concrete caps have been installed on the left and right corners, and the downspout has been installed on the right column. This view from the top, taken on September 12th, shows the completed garage in a somewhat wider view than the previous picture. The black strips on the roof are seams between different pieces of roll roofing. Given the very shallow pitch of this roof (it qualifies as a flat roof) I needed to make some compromises - I selected white material for heat reasons (black material would have raised the heat to unbearable levels in the summer), and thus the seams would show. 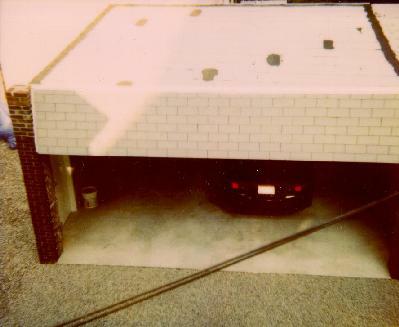 I could have discarded the pieces of roll roofing that weren't long enough to run the full width of the garage, but that would have resulted in doubling the amount of material (note that the seams occur every 1.75 rows). In this ground level view, you can see the side door as well as some more of the surrounding neighborhood. 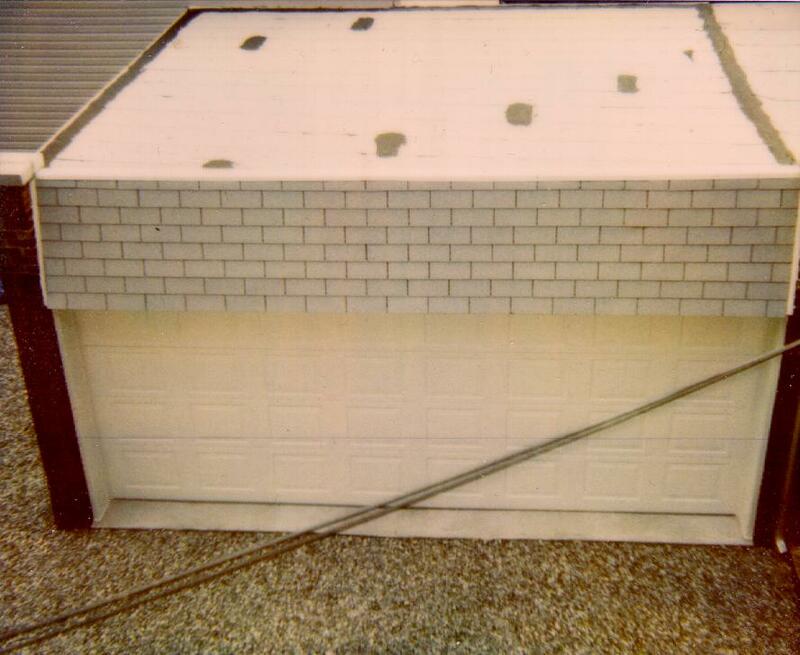 Note the unusual appearance of the side wall of the garage, due to it being built out of chimney flue. To the right, you can see the attached part of the garage on my neighbor's property, along with the collapsing front brickwork. My garage was in similar shape before it was rebuilt. The common wall between us had all of its mortar repaired and was strengthened as part of this work, so if my neighbor's half collapses, it won't take my garage with it. 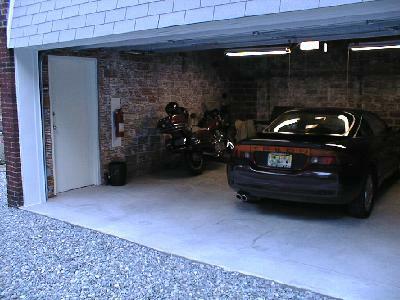 Looking into the garage, you can see the opener and lights, as well as the car and motorcycle. Additionally, there's all the usual stuff you need in the 'burbs - a gas barbeque, shelving, and so forth. You can also see the unique texture of the chimney flue on the walls. 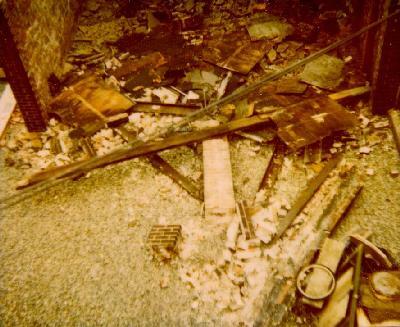 Looking at the other side of the garage, you can see the inside of the side door, as well as a fire extinguisher on the wall and a garbage can below it. After this picture was taken, an indoor/outdoor digital thermometer was added next to the extinguisher. Future plans include adding a telephone extension in the garage, a rooftop ventilator to circulate air in the summer (the thermometer has registered peaks of 110 degrees) and replacing the fluorescent lights with high-output models so they start reliably in the winter (regular type lamps don't want to start below 50 degrees or so, while the thermometer has registered a minimum of 9 degrees in the coldest part of winter). Accessibility Policy This page last modified on Monday, 02-Nov-2015 23:01:15 EST. So, what's a glaver anyway? 7 hits this week, 42898 since 6/30/2000.